It is a widely accepted fact that Bahria Town has proved itself as one of the most dynamic companies in Pakistan. 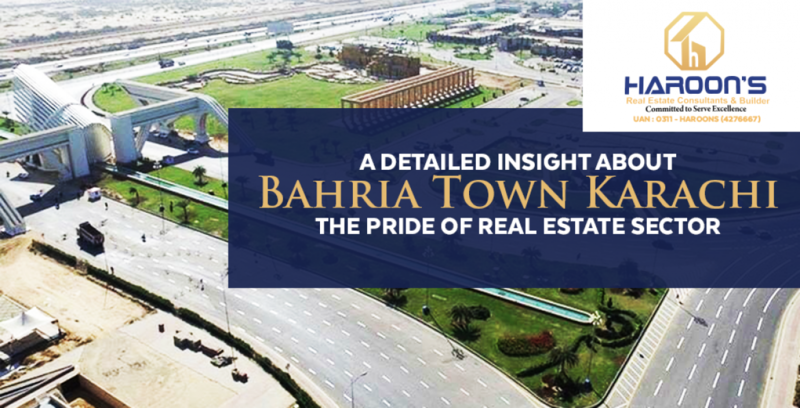 With its world-class projects and unbeatable pace of evaluation, Bahria Town has entered into the real estate sector with a completely new strategy and class. Although there are multiple projects established by Bahria Town in various cities yet none of them could beat the fame and attention which Bahria Town Karachi has grabbed. And of course, there are reasons for that! But before we discuss those, let’s have a look at some insightful details about the project. Bahria Town Karachi is a magnificent addition to the chains of housing schemes by Bahria Town in different cities of Pakistan (mainly in Lahore Islamabad and Rawalpindi). Bahria Town Karachi was initially launched 4 years ago on 26 January 2014. Ever since then, Bahria Town Karachi has become the ultimate symbol of luxury and prosperity. Although Bahria Town Karachi is the sole of many powerful sub projects some of its most highlighted projects are Bahria Paradise Karachi and Bahria Sports City Villa. Bahria Town Karachi is located on Superhighway, away from the hustle-bustle of such a busy metropolitan like Karachi. It is approximately 9 Km away from the toll plaza. Being far away from the main city, it can be considered as a disadvantage for a housing society. But Bahria Town Karachi is not just a housing society, it is a whole city within the city. From hospitals to standard schools for children, you will find every facility and necessity provided within the boundaries of the project and that also at its best. Also, in the distant future, a metro bus project will probably also come to life will which make things easier. The location is the only main perspective that every buyers want .A perfect house is that when it is constructed on an ideal place just like as Bahria town projects that are providing all the amenities of living. As mentioned before, Bahria Town Karachi is an entire city under which many mega projects will be operated. Although it was launched 4 years ago, yet it developed with the passage of time. Some projects are still under construction and development phases. But despite the overtime evaluation, projects like Bahria Paradise Karachi and Bahria Sports City villa have been in the spotlight from the very beginning. On the other hand, if we look at it from an overall all perspective, Bahria Town Karachi consist of Residential and Commercial plots, Bahria Homes and Bahria Apartments. Some projects were launched on the initial basis with an easy installment plan while others were launched afterward with comparatively increased values. On residential plots, Bahria town Karachi offers 125 Sq. Yards, 250 Sq. Yards, 500 Sq. Yards, 1000 Sq. Yards and 2000 Sq. All these plots have been distributed systematically among the projects as per the required need. 5 Marla residential plots are offered in Ali Block. While in Bahria Golf City and Gwadar Golf City 500 to 1000 sq yard plots are available. On the other hand, 10 Marla residential plots are offered in the overseas block precincts 1 for the people who live outside the country. 200 SQ yard plots have also been spared for the golf-loving community. The current highlight of commercial plots in Bahria Town Karachi is Jinnah Avenue International. It consists of 500 sq. yard which is ready for possession. Besides that 125 Sq. Yards, 200 Sq. Yards and 250 Sq. Yards are available in Bahria Town Karachi. 125 sq. yard plots are dedicated to Midway commercial for which the balloting has already been done. Bahria Homes are located in Quaid block. They are double story houses for families with few members. Bahria Homes consist of 125 sq yard and 200 sq yard plots. Without mentioning Bahria Paradise Karachi, one cannot completely define the excellence of Bahria Town Karachi. Based on the theme of New York’s Central Park, the housing society is full of natural beauty with other world-class facilities. Moreover, Bahria paradise booking comes up with an easy installment plan which makes it easier for people to buy or invest in the project. Bahria Town is doing their best in the residential development of the country and this is what we and many other are expecting from them. Another well designed and highly modernized project of Bahria Town is Gwadar Golf City that is designed with all the basic amenities and making a perfect example of Luxury at our doorstep. This sports-oriented housing society includes some incredible luxuries to support a healthy lifestyle like cricket stadium, playground, and go-kart jogging tracks, gymnasium, spa and many more things which make it so popular among masses. Bahria Sports City along with having such amenities also features some incredibly designed four and five bedroom luxury homes. Constructed upon classic architecture and quality materials, Bahria Sports City is indeed an ideal place to live. Of course, you won’t just want sports facilities in a housing society to be good. There are other things also which you would like to have in order to attain a luxury but healthy lifestyle. Therefore, Bahria Town Sports City has a 5-star luxury hotel with beautifully designed rooms & suites, conference rooms for high profile business meetings and an eclectic mix of dining options to savor delightful cuisines. Also, the location is very ideal. It is literally in the heart of Bahria Town Karachi with Jinnah Avenue very near to it.